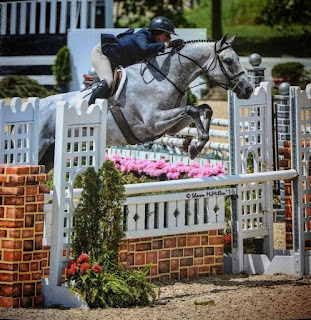 When Deirdre Catani was thinking of what to name her new horse, she wanted something that started with a G. "His passport name started with a G so I wanted to stick with that," she explains. Emil Spadone had imported the four year-old gelding from Europe and Catani's father, Carl, bought half of the horse from Spadone with the plan of Deirdre competing him. Given that she is a huge Patriots fan, Deirdre decided to name him after one of her favorite players, Rob Gronkowski. She went with Gronkowski's nickname, Gronk, and added the number 87 on the end, which is the real Gronk's jersey number. Gronk poses with the Patriots Super Bowl banner. Gronk 87 has turned out to be as solid an athlete as his namesake, picking up lots of top prizes for Deirdre. They excelled in the pre-greens last year and now are finding success in the green conformation and the 3'3" derbies. "He's super athletic and just a really good horse like Rob is a really good player," she says. The other thing Rob Gronkowski is known for is his super-sized personality. The more she's gotten to know the horse, Gronk, Deirdre feels the name fits him. "He's kind of a goofball. He has a fun personality like Gronk," she says. Both Gronks like to goof around! Not everyone at the horse shows is a football fan and it's mostly the dads that Deirdre says approach her to discuss his name. When they aren't Patriots' fans, she's libel to catch some grief. God forbid she encounters a Falcons' fan! Deirdre has yet to figure out a way to let the real Gronkowski know he has a horse named after him but she thinks he might appreciate it. 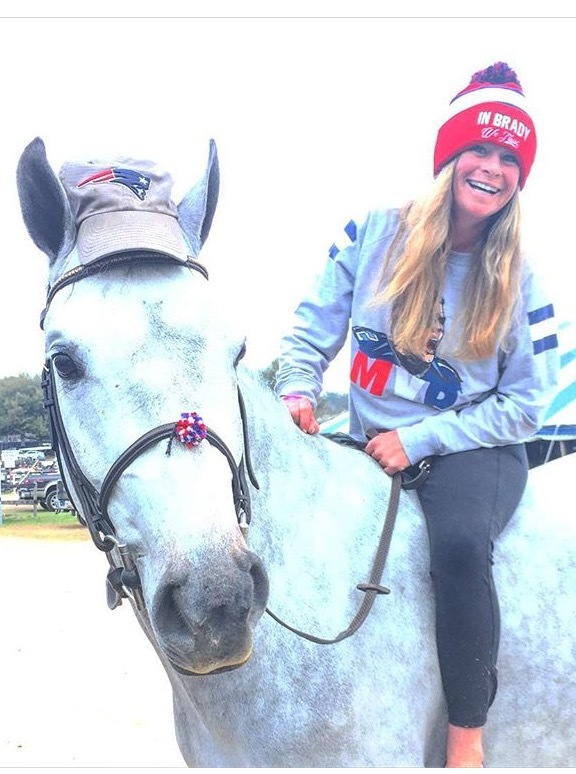 One of Deirdre's Instagram photos of Gronk the horse was reposted by the Patriots, however, so maybe the real Gronk does know about his namesake. 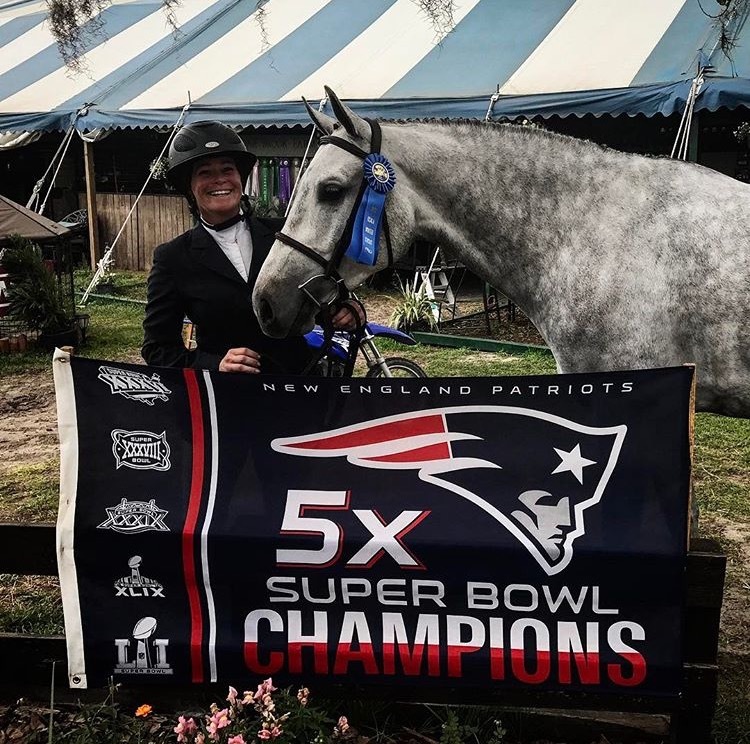 For her next horse, Deirdre already has another Patriots-themed name picked out. This one involves Tom Brady but might have some interesting symbols in it that maybe only football fans will understand!